The Australian city of Canberra is now home to its first all-electric and hybrid buses, following the launch of a new 12-month public transportation fleet trial last Monday. This $900,000 trial involves the leasing of two all-electric buses from Carbridge and one hybrid bus from Volvo. The electric buses are being leased by the Australian Capital Territory (ACT) government. These all-electric and hybrid buses will see their performance gauged against ACTION’s existing fleet of diesel buses. Following the trial, ACTION’s ageing fleet could actually be replaced entirely by either the all-electric buses or the hybrid ones, or perhaps a mix. The territory is currently aiming for emissions to be reduced to 40% of 1990 levels by the year 2020. The electric buses will be recharged overnight at the Tuggeranong depot, where charging stations were installed a while back. 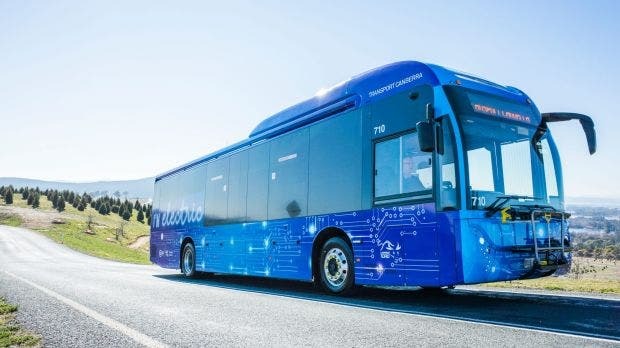 Notably, plans are for a third all-electric bus to be added to the Canberra trial by the end of the year.